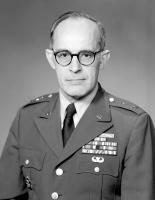 See the gallery for quotes by William Odom. You can to use those 8 images of quotes as a desktop wallpapers. 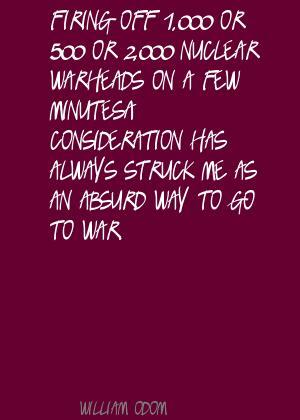 Firing off 1,000 or 500 or 2,000 nuclear warheads on a few minutes' consideration has always struck me as an absurd way to go to war. 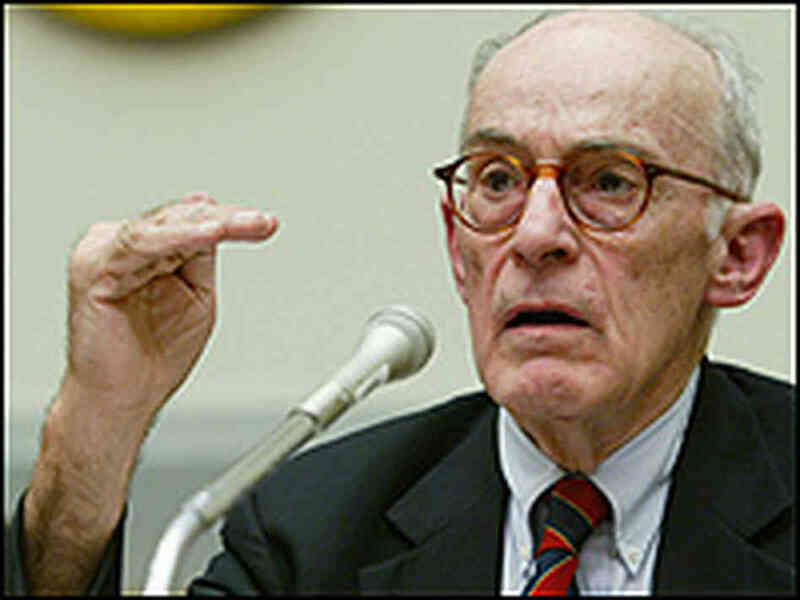 It was not in our interest to enter Iraq in the first place. Once we destroyed the Saddam regime, we knew there was going to be a civil war. Second, recent polls over there show that the majority of Iraqis want us to leave precipitously. The presidents I served under don't have anything to do with my politics. 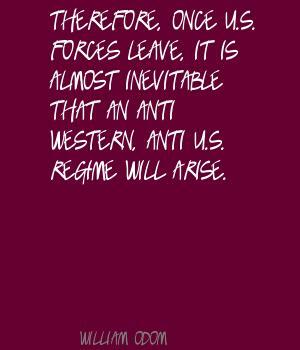 Therefore, once U.S. forces leave, it is almost inevitable that an anti-Western, anti-U.S. regime will arise. I don't think that the war serves U.S. interests. I think Osama bin Laden's interests and the Iranian interests are very much served by it, and it's becoming a huge drain on our resources both material and political. I remember serving in Vietnam in that war, and many of us at the major Lieutenant Colonel, colonel level were frustrated that no one in the U.S. wanted to debate it that way. I will make a general statement that we have not had anything like the policy of holding people in high office responsible for their acts that I think we should. I've decided that the political context is such that the only way reform will finally come about in the Russian military is that the deterioration goes beyond the point to which these old generals can stand up there and resist it. 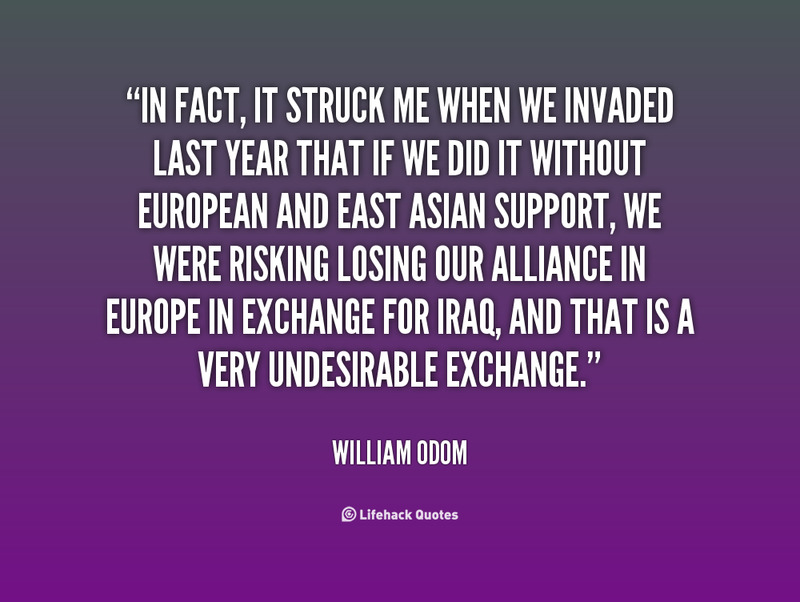 In fact, it struck me when we invaded last year that if we did it without European and East Asian support, we were risking losing our alliance in Europe in exchange for Iraq, and that is a very undesirable exchange. In World War II in Germany, we had a ration for one U.S. soldier, or one allied soldier for every twenty inhabitants. The ratio in Iraq is about one for a hundred and sixty. So the idea that you could put Kurds, Shiite Arabs, and Sunni Arabs in a nice, liberal, federal system in Iraq in a short amount of time, six months or a year, boggles the mind. To say that you now trust the Russian military command and control system because some Russian general told you from the bottom of his heart that's the case, strikes me as most unrealistic. We need to go to the niceties of approaching the U. N. and let them have a chance to take it over, but we should set some sort of date and begin to move out and leave it to whoever takes over. We've already seen proliferation. We started it with Britain, then France. Then we benignly let the Israelis do it. The Pakistanis and the Indians have recently done it. The Chinese have nuclear weapons. While people out there on the spot certainly have to be held accountable for what they've done personally, the chain of command responsibility for this strikes me as just as important and should be dealt with. The reason why I found acting is because my father passed away. He passed away really young. I was going to go to med school. My father's dream was that all of his kids become doctors. I realized in school I didn't like it. When he died, it was like a wake-up call. Life is too short to do something you don't want to do. I have a Twitter handle, but I never sign on. Much more quotes by William Odom below the page. I love that you can watch a film and 10 years later still be affected. I think L.A. is beautiful. I took acting classes in my senior year in college and I loved it. I want to tell authentic, real stories with real characters. I would come to L.A. for a job, but I love New York. My first audition was an open call and I had no picture and no resume - that's how clueless I was. I just thought I could show up. My intention is to do more films. My mother's a pretty warm, open person. That's what you want art to do, to open people up and start conversations. There are conservative people in all colours in America. At the end of the day, if I can say that I had a career where I was able to play all different kinds of characters and I'm known as someone who is well-respected for my approach to the craft, that would be a beautiful life.